And here's the same setup (sidelight and toplight) with a ring flash added to the camera lens. I apologize for not responding sooner - haven't been able to get through to the forum in two days. Yes, rim lighting can be back, side, top lighting - but it is a specific style that only gives a highlight on the very edge, or rim, of the subject. As in the darker side cheek of the model in your first pic. In one of those 7million sites that I found, the photographer uses a flexible 50-foot light ribbon, which he winds around in various positions to get the effect. 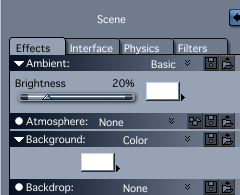 A very puzzling feature of Carrara is when I switch on the "show scene lights", it gives a pretty good idea of where light will fall and it looks great in the viewer, but doesn't render the same as shown. Good pics, by the way - especially the eyes. I am not arguing about the effect of giving a highlight on the edge, or rim, of a subject. Of course that's an option, and many people use that. My only point is that just because there are 7 million websites that discuss "rim" lighting, that doesn't mean that everyone uses the same term for the same effect. Because they don't. Even in the first link you gave with the 30 or so "rim light" examples, a commenter said the guy was way off in his use of the term "rim" for the examples he was posting. Which is why I tend to be more specific in my terminology. Doesn't mean anyone is "right" or "wrong" with their terminology, what's important is whatever does the job. And if I tell someone to add a rim light, I know that they'll ask for a lot more clarification than if I ask for a sidelight. And if I tell 'em I want a "hair halo", which is my own personal term (and you probably won't find in Wikipedia), everyone knows right away what it means and how to do it. Which is also why I caution people to be a bit skeptical when they read something on the internet or Wikipedia, and assume it's fact, or universal. In any case, clearly there were people here who weren't clear on the concept of lighting the subject from behind and taking advantage of the subject's translucency, and were trying to mimic that effect by using extremely intense lights to force the effect. Hopefully things are a bit clearer now. BTW, I'm kinda puzzled at why a photographer would go to the trouble of finding a 50 foot long light ribbon and coiling it around the subject just so he can get the same effect he could get with a single spot light. No argument from me on the terminology - I just find the term "rim light" so specifically descriptive, whereas side light or back light can mean many things. If you take a look at the link I posted you will see excellent examples of what I mean. Also on the main Daz home page - the Michael figure is a good example. Okay, well I'm not gonna chase you down a rabbit hole, so I'll drop it. Nothing I've seen requires a 50 foot long rope light or 20 foot diameter ring light. Best I can tell all you need is a single spot with a narrow beam or barndoors. Thank you for the complement - firstly, I am not a skilled 3d artist and make no pretensions of being one. I am primarily a modeller and more of an artisan than an artist. Which is why I am so interested in learning correct lighting techniques - so I can present my models in the best possible light - pun intended. Secondly, I don't know what you mean by "Poser nostril glow" - I certainly don't see anything like that in my renders and the light shadows are on full - maybe our monitors are set differently and we see things differently? But thanks for the concern - I'll bear it in mind. I'm attaching your latest with arrows to show what I'm talking about. Her right nostril interior is bright compared to the surrounding nose. Very bright. And the far side of her nose and eye, the left side of her face, are lit, even there's no apparent light source lighting that area. If you look at her face, the lighting doesn't make sense. It's as if the light was bending around her face, which it can't do. Also, her right cheek is partially in shadow, though her upper right lip is lit. The only thing I can figure is you've got a light somewhere with either cast shadows not checked, or the shadows are set at something less than 100%. Or maybe you've got ambient light set above 0. Okay, I did a quick reproduction of your scene, and it sure looks like the key light (the one off the subject's direct right side an pointing down at around 30 degrees) has shadows turned off, or shadow intensity set very low. First image is without shadows, second is with. Thank goodness! Here was me thinking "Rudolph?" You could well be right about the shadow reduction - I've changed the settings so often since then - do recall lowering the shadows on some lights in a fruitless bid to soften the unnaturally dark shadow in the eye sockets. So this Poser nose glow thing is possibly the light penetrating the nose mesh and shining in the nostril? Anyway, thank you for pointing it out and showing me the right way. This my first effort at doing an e-doll close-up - trying to get some play of light and shadows to give an otherwise bland face a bit of interest. Here's another take - this time with a studio lighting HDRI and two globes - an improvement, I think, but not happy with the skin. This is Elite Glamour GI - will have to play around with SSS and translucency? Another thing that can cause nostril glow is using the shadow buffer to simulate soft shadows. If you're doing a portrait or still image, and you want soft shadows use the raytraced soft shadows. It does take a bit longer, but there are tricks to speeding it up. If you're doing an animation, then a shadow buffer may be what you need, especially if it's a fast moving shot. More good info ...keep em coming! Stop with the HDRI and GI and SSS and drag 'n drop solutions. You'll never learn about lighting if you're always going for the fancy or prepackaged solutions. It's why most amateur/hobbyist images all look the same and have no impact, and why stuff like "Poser nostril glow" is so common and, to many, so obvious and silly looking. The throw a bunch of stuff that they don't understand at their images and hope it will look good. If you really want to showcase your modelling efforts as well as you can, start simple. Get rid of all the stuff you mentioned, and spend the next two weeks learning about spotlights. Just spotlights. Nothing else. 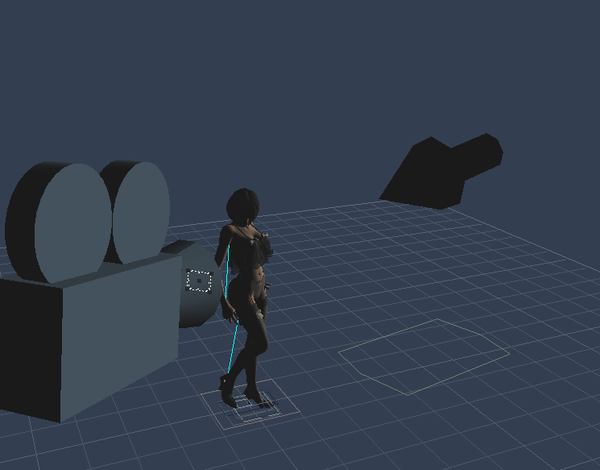 Put a model in a scene, black background, NO AMBIENT LIGHT, no fancy HDRI or GI or SSS or whatever. Just insert one spotlight. Get rid of the default distant light. And that's it. Leave all the default settings. Which means 100% shadow casting. 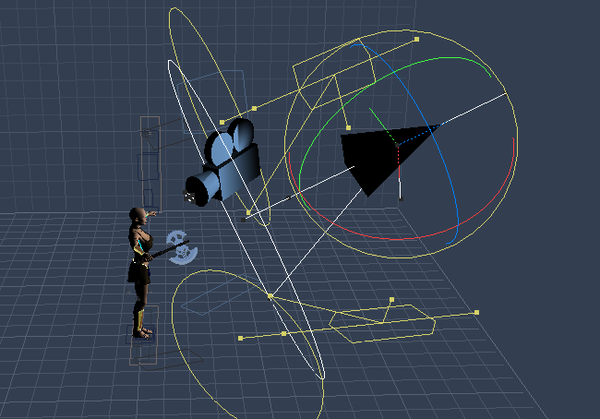 Now, just go in to the Effects and select Enable Soft Shadows, and set it at around 1 or 2 ft. light radius. Now start doing renders as you adjust the spotlight. Change the half angle down to like 5 degrees, point it at the subject, and render. See how it looks. Put the spotlight to the front, to the side, above and below the subject. And spend the next two weeks just trying out the one spotlight. Then start adjusting the Effects. Just play with Gel, Shadow, and IES. Try them all, see what they do. Then spend the next month or two doing your renders using only that one spotlight. Every scene, every render, just try to get the best possible image using just ONE spotlight. No ambient, ALWAYS have 100% shadow casting, and just try to get the best possible render. You can't learn if you're trying out 12 different things at the same time. It's great for playing with software, and if that's what you want to do, then fine. But if you really want to learn like you say, you have to learn. And the only way you're gonna do that is start simple, and start with the basics. Now, I'm putting this in a different post because it's so important, but so often overlooked. Vary the light color. I guarantee that 99% of amateurs/hobbyists never touch the light color, and leave it at the default white. But it can have a huge impact. Just a tiny variation in light color (ie, slightly blue or yellow or whatever) makes a huge difference. Try it. What Joe said about the lights is great advice. The other thing I would suggest is the background. The one you used for this image looks bland and dull. Try doing some with plain black, plain white, then try different colors to complement different lights. If you want to use a multi-light set up, set up each light in turn. When you have your first light set up, make it invisible and set up the next light, etc. making each previous light invisible while setting the next one up. When all is done, make them visible and see if it's what you want. This can help with aiming lights and knowing what shadows are being cast by what light. 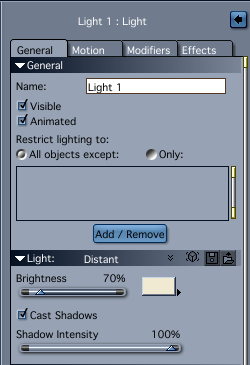 I don't know if you're aware of this, but to help in aiming lights, you can use the interactive renderer to view scene lights in the assembly room. Doesn't seem to work with shape lights though. At least not in C7. Yes - good advice. The shape light does show up in C8.5. As tedious as it sounds, I'm going to take Joe's advice and really get to grips with lighting. Be careful with plain white backgrounds. One thing that isn't covered in software manuals, therefore most beginners don't consider (but is extremely important), is that when humans look at images their eyes tend to jump first to the lightest part of the image. Which is why Roy's background is kinda disturbing. Very light, and overpowers the subject. That's why I suggest starting with a black background. Keeps things simple, keeps you focused, and helps you understand the effects of the lights alone, without the interference of any background. But yes, as you understand the lights, you can then focus on the background and see what effect that has. I try to keep people focused on one thing at a time, otherwise it's too easy to get confused and sidetracked. When you're ready to try different light colors, do a search for a chart of what's called "color temperatures". I think the Birn book (y'know, the book everyone has but nobody reads....) has one. Every light source has its own color, based on how hot it gets. The sun is totally white because it's "white hot". Candles aren't nearly as hot, so their color temperature is less, and they give off more of a yellow/orange-ish. Skylight, bouncing off the atmosphere, is a cool bluish. A tungsten lightbulb has it's own color, as does a fluorescent light. Every light source has a different and specific color. So if you're going to use a spotlight on your subject, you should probably use a light color that matches a real light bulb, or else it might look wrong. Of course you can use whatever colors you want, but when stuff is located outdoors people expect there to be some blue light, or else it doesn't look like outdoors. And when it's indoors, they expect the light to be yellowish. And when it's lit by a candle or a bonfire, they expect it to be yellow/orange-ish. Just an example of a white background, in what I consider a decent image. There are risks, but as I'm sure, we've all seen plenty of advertisements with white backgrounds. A company isn't going to spend large amounts of money if you're not going to see the product. If you're learning lighting, it's not a bad idea to see what works for different backgrounds. Color temperature is very important, but you can have white hot and cool white. Kind of depends on the context of things in the image, such as lights, materials and their color, etc. etc. Not saying not to do the research, because it is important to understand, but color temperature should be something you consider for the whole image. Black and white are good neutral colors that have a nice dynamic effect on an image. Grey is neutral as well of course, but it lacks any drama. The same with beige. The scene is simple. One distant light set at 70% and slightly yellow for highlights, the color white in the scene's background. The scene's ambient light is (and Joe is gonna hate this, so apologies) the default setting which is white at 20%. The render settings are also pretty simple. I turned on the Skylight, but not full Indirect lighting. The white background acts like an HDR or realistic sky and generates a nice even light. I did no postwork to the image except to convert to .jpg for the forum. Rendered in 8 minutes on my old computer. I'm not trying to be difficult, just make a point. Why do you consider it a decent image? Not trying to be difficult myself, but I see no need to write an essay. I think it's a good image. I like the framing, I think the skin tone comes out nicely, I like the lighting. the highlights are nice. I like the simplicity of the image. The contrast between the white background and the black (lack of ;-) ) clothing helps to define the subject. My point in posting is that there are no hard and fast rules. I do agree with you that there are concepts that you need to understand, and I agree completely, the best lighting practice is to do as you suggested a few posts back. However, there are always- always exceptions. I myself am not a fan of scene ambient light. In this case, I think it helps the image. To be honest, it was a happy accident as I forgot to turn it off. Now my question to you is, why do you think it's a good image (if at all)? All of your descriptions of the image are either "nice" or "I like". Which is fine, nothing wrong with that. If your sole goal is to produce images that EvilProducer will think are nice, or he likes, then you've succeeded, and that's great. But look at the following two images. There's only one difference in the two images, and that's color temperature. And they give completely different feelings to the viewer. Any viewer. Why is that? 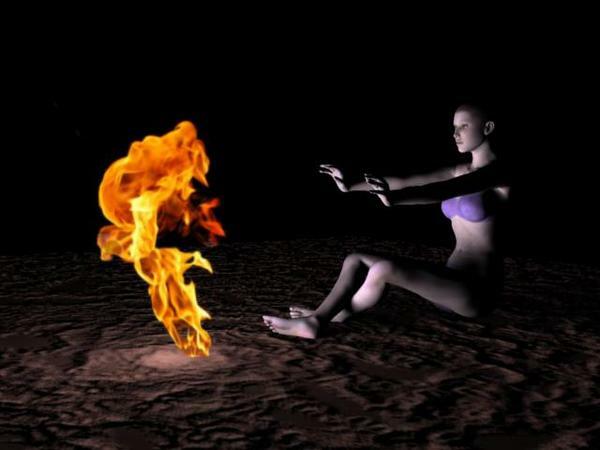 Because we all know instinctively that a bonfire gives a warm, yellow/orange glow. And that particular color makes us feel a certain way. The blue image looks wrong, and doesn't give us that feeling. That's not an Evilproducer thing, or a Joemamma thing, it's just about everyone. That's just one bad example, but the same thing applies to all of your lighting. You have to be very mindful of how different colors affect us if you want to have images that more people than just Evilproducer will think are "good". In my view, a really good image is one you could easily write an essay about. It says something, tells a story, gives you a feeling or emotion, it's universal. The same thing I keep bringing up over and over and over in this forum, trying to get folks to think about how others perceive their images. Your image is, well, pleasing. It doesn't make me feel anything, I don't feel a strong character in the subject, it doesn't tell a story, it's just nice. Nothing wrong with that, if that's your goal. Sorry, you're mistaken. You need to know how to pick your battles with the rules, but they aren't hard and fast. Let me be clear, rules can be bent and even broken. I'm not saying you should go out of the way to do so, and it's important to know what the rules are, but if you lock yourself into a rigid formula, eventually you kill creativity. Just because you study Leonardo or any of the Great Masters, and distill a formula for this, and a ratio for that or a color scheme for whatsit doesn't mean that you will produce the next great masterpiece. Understanding what they did and how they did it is important, but slavishly following a formula doesn't produce greatness. It can help, but creativity is more important. I did notice you completely chose to ignore my statement about color temperature. I did say that it was dependent on other factors in the image. Your initial example of white as being hot is highly dependent on the subject. The hottest part of the fire is white, that's somewhat true. Snow is also white, and people will no doubt interpret a white color palette in an image where the subject is dressed in a coat as cold. You don't even have to have the subject bundled up. You could pose the figure in a manner that suggests shivering and still get the cold interpretation without any other visual cues. Again, it's dependent on the scene. If it was the glowing embers of a dying fire that was illuminating the scene wouldn't an orange/red light be the better choice? Regarding my image, I used the terms "nice" and "like"because I have a sense of humility. Maybe it's my mid-western roots, but self aggrandizement does not come easily. I certainly didn't use them because I intended to damn my own image with faint praise. As to the essay, I could write one, but I'm not. Much for the same reasons you don't post many examples of your own work (excluding this thread of course), I simply don't have the time. Oh, by the way, great way to try and dismiss an opinion that differs from yours by again implying "hobbyists" lack any knowledge or discipline, while at the same time implying the person with which there is disagreement doesn't know what he's talking about. Good try at misdirection. Okay, Evil, this is where I drop it because it has become too emotional. I'm not attacking you, merely trying to make a point. But you seem to want to make it into a game of "who knows more", which is not the point. I'm sorry if you feel attacked, wasn't my intention at all. I see people doing the same things over and over and over with their images, and those things are holding them back, but they don't realize it. I'm just trying to help out with some of it. Edit: I had the pleasure of studying critical reasoning a while back. It's good to see many of those fallacious argument techniques being used in this thread! You miss the point. I'm not saying who knows more or who knows less. I'm saying that you think these rules you refer to are hard and fast. I say that they are important, but malleable. Re-read the post I quoted and take in the context of the previous couple posts and be honest, the subtext in the post I quoted can be taken as a dig. I'll take what you say at face value, if you say you meant no offense, then I'll take it that way, and offer my own apology for taking it the wrong way.